Boasting without a doubt the strongest freshman class of 2017, Carleton CUT gave its superbly talented rookies plenty of big game experience last spring on their run to a championship, experience that has elevated the team to the precipice of a repeat. Seniors like Sol Yanuck, Henry Fisher, Eric Taylor, and Alex Olson are some of the best in the college game, no doubt, but if CUT repeats in 2018, it will be because of their sophomore class and its impact in every facet of the game. Let’s start with the two biggest names in the class coming in last season: Dillon Lanier and Stan Birdsong. As freshman, both were important role players on CUT’s ultra-efficient offensive line. Now their roles have expanded, allowing them to interchangeably cut off one another, stick in the handler space, or chew up yards downfield. They aren’t quite at the “superstar level” (CUT does a fantastic job of not relying too heavily on one player regardless), but they certainly have that capability. While both occupy a similar role in CUT’s offense, each has particular strengths. Birdsong’s length and athleticism are useful tools to have on the rare occasion when CUT’s offense stagnates. CUT loves putting Birdsong on an island, where he can be especially deadly. It’s always nice to have someone like Henry Fisher on the same line, as his size and speed almost always necessitates backing and/or help defense. Birdsong is adept at taking advantage of this, reading the defense and adjusting his cut accordingly. With Fisher graduating, look for Birdsong to take over his big man role next season. Lanier, on the other hand, is a distributor first and foremost. He excels at identifying a defense’s weak point and exploiting it, no matter the scheme. He’s the quintessential popper/mid: patient, confident, and seemingly always in the right place. His bevy of throws don’t hurt, either. Add in potent deep targets like Birdsong and Fisher, and Lanier becomes a terror from anywhere on the field. 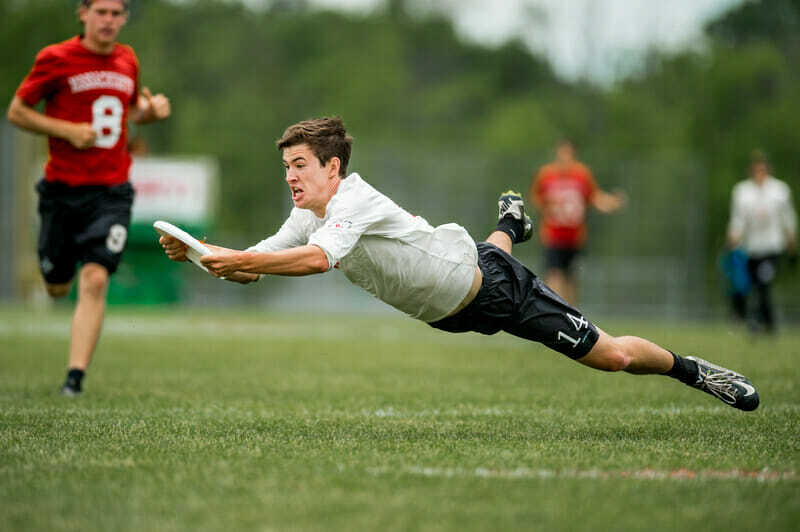 On the other side of the disc, Ethan Bloodworth has been a revelation this spring, providing both stingy defense and potent offensive firepower on a turn. He’s been so good, in fact, that he’s in the discussion for 2018 Defensive Player of the Year and Breakout Player of the Year here at Ultiworld, something that’s never been done before. Chris Padilla has stepped up to a handling role on the O-line, using his imposing frame and lateral quickness to keep the offense humming. While he normally operates as more of a reset, Padilla filled in as the team’s center handler and performed admirably when Alex Olson was out at Easterns. That’s not to say Padilla and Olson are the same player: on the contrary, they’re about as different as two center handlers can be. Whereas Olson loves to shoot deep and break the mark, Padilla is much more comfortable using quick movement and give and gos to gain yards. It makes sense: the 6’2” Padilla can use his bigger frame to bully defenders, while the 5’10” Olson needs a little more guile. With Olson graduating this season, CUT’s offense may change a bit with Padilla at the helm, but its dominance won’t. After being on ice since winning a U24 title in Perth, Joe White made a triumphant return at North Central Regionals, powering CUT to a dominant tournament victory. Unlike Lanier and Birdsong, White wasn’t on the U20 national team and entered Carleton with little fanfare, but after his irreplaceable contributions en route to a CUT national title, starting on High Five’s D-line, and his exceptional play for the U24 USA Men’s team this winter, that’s quickly changed. White isn’t just a defensive stopper: he also plays a major role after the turn. As a big target, he looks deep often but isn’t afraid to take the unders and shoot. If anything, he looks deep too often: he had four upwind huck turnovers in the national semifinal. If White can hone his decision making, he could become one of the most dominant players in college. But wait…there’s more! Luke “Nando” Webb is a D-Line mainstay, Jared Kannel was a fantastic co-handler for Padilla at Easterns, and transfer Andrew Roy is showing why he won Division III Rookie of the Year last season. All told, CUT’s roster boasts 12 sophomores — a dozen players that, were they to form their own team, could still compete at an elite level. With this crop of supremely talented youngsters adding to an already skilled core, Carleton will remain a national title contender for years to come. And, should they live up to their number one seed in Milwaukee, the word “dynasty” might not be that far off. Comments on "No Slump In Sight: Carleton’s Super Sophomores"